BATU KAWAN (Sept 29): Eco World Development Group Bhd (EcoWorld) will be launching the first phase of landed homes in its Eco Horizon township in Batu Kawan, Penang this weekend. Eco Horizon is a 300-acre township development of which some 230 acres will house over 2,000 landed homes while 70 acres will be used for its commercial component. With a gross development value (GDV) of RM7 billion, it will be developed over a period of 10 years. Named Ashton, the first phase will comprise terraced homes, super linked homes and garden homes, all which are two-storeys. There will be another three phases of homes called Brydon, Camdon and Dawson. Ashton will have a total of 704 units of which about half will be open for sale this weekend. In an exclusive interview with EdgeProp.my, EcoWorld’s northern region general manager Chan Soon Wah said 50% of the units will comprise terraced homes while the remaining will be super linked terraced house and garden homes with an equal distribution of 25% each. The first phase of homes in Eco Horizon is slated for completion in 2020. “This will be the first gated-and-guarded development in Batu Kawan. With built-ups ranging from 2,290 sq ft to 2,601 sq ft, the average price of units in phase one is RM940,000. We will also be introducing our garden homes — a hybrid of a terraced home and a semi-dee. It has a 120ft garden on the front porch and a 20ft back garden. Only one side of the home is connected to your neighbour. This allows ample natural light into the dining area. “We have introduced this garden home concept at our townships such as Eco Grandeur and Eco Ardence in the Klang Valley, but this is the garden homes at Batu Kawan,” said Chan. There will also be a 3.6-acre centralised clubhouse. Residents will be able to use the facilities for free in the first year. The group will also be creating two flamingo-shaped lakes amidst a 13.6-acre landscaped park. “This will be the first lake park of such a huge scale on the mainland and perhaps Penang. This is one of our value added features we want to give to our homebuyers. “On the island, homebuyers are paying some RM700,000 to RM800,000 for condominiums and there is a scarcity of land. We believe there are still people who want to own landed homes, and here in the mainland, there are big plots of land which enable us to build this kind of development,” Chan shared. He added that with industrial developments and factories in the vicinity such as Sandisk, VAT Manufacturing, Honda and Hewlett Packard, there have been plenty of job opportunities and creation. This in turn, has created a need for housing. “There are also people currently staying further away such as in Sungai Petani who have also showed expressions of interest. It only takes about 45 minutes to drive to Batu Kawan. In 2019, IKEA will be opening while Penang Design Village is already in operations. There is also the upcoming KDU College in the area while medical facility, Columbia Asia is also coming in. We see a lot of potential homebuyers mostly buying for their own occupation especially families as well as upgraders in the area who want to enjoy a lifestyle living,” Chan elaborated. 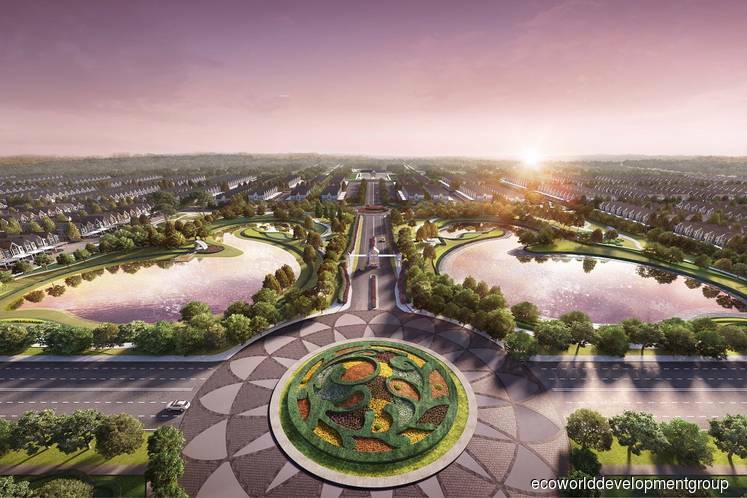 Chan added that a few developers in the area including EcoWorld are currently in discussions to upgrade the landscape in the area. The development is accessible via the North-South Expressway via the Batu Kawan toll plaza. A proposed Bandar Cassia Trumpet Interchange with a new toll plaza is currently being planned by the Penang Development Corp to ease traffic flow in and out of Batu Kawan to the North-South Expressway. As for the commercial component, Chan noted that it is in the planning stage and the concept will be revealed next year. “With more people coming to work and live here, we want to make sure we bring in shops that will suit the needs of the people here. After we launch Ashton, we will be focusing on another new mixed development we have in Batu Kawan, the 75-acre Eco Sun, which is about 10 minutes away from Eco Horizon,” Chan revealed.